This book will inspire readers to see every circumstance as a chance to know God more deeply. If you have asked yourself these questions or many others, you will not want to miss this book! In the first part of the book, author Sara Hagerty speaks of her struggle with infertility. Although I have not experienced this type of heartache, I was immediately drawn in the pain she felt. As God began showing her a different path in motherhood, she wove the trauma and heartache of infertility into something beautiful. While reading her book, I felt as though she was grabbing me by the hand, leading me through her life experiences, sharing her struggles and the beauty that came at the end of those struggles. It’s a riveting story to read, but Sara’s life, like ours, is much longer than a few pages of words. The light at the end of the tunnel is often dim. Life doesn’t pause in between our own struggles. Instead, life weaves us through both the bitter and the sweet. My experiences are not the same as Sara’s, but I can relate to the ups and downs, the struggles and triumphs, the bitter and the sweet. Her story gave me pause to think about all the times that God had His hand in my life. Her story inspired and motivated me to want to have a more intimate relationship with God. Her story is a comforting reminder in knowing life can be bitter, God’s plan makes it sweet. Sara has a crescendo style of writing meaning that one chapter was gradually building up to the anticipation of the next chapter. Her style of writing kept me intrigued, kept me going, kept me anticipating for the next word, and kept me relating to her struggles. Many women read Sara’s blog, but I don’t think she wrote this book for only women in mind. Her story can easily relate to men as much as women. As my husband continues through Seminary, I like to read books that I can also add to his library. 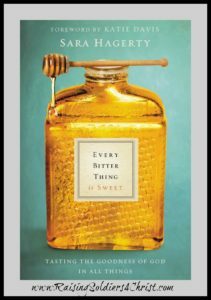 Sara’s book, “Every Bitter Thing is Sweet” is definitely one I will encourage him to read and add to his library. Sara’s story is beautiful, well-written, and just heart-moving! I love this book and give it a 5/5! If you want a copy you can get it at FamilyChristian.com!